Clearwater, Florida (August 30, 2012) ­— As the state of Florida continues to reel from the death of Trayvon Martin, as well as a reported increase in anti-Semitic vandalism, harassment and bullying in South Florida’s neighborhoods, schools, and Jewish institutions, many are left wondering, how can we best combat the dangerous impact of discrimination and hatred? The Simon Wiesenthal Center’s “The Courage to Remember: the Holocaust 1933-1945” traveling exhibit strives for just that, empowering generations to resist ignorance and fight discrimination, as it comes to Clearwater September 5 through September 27. 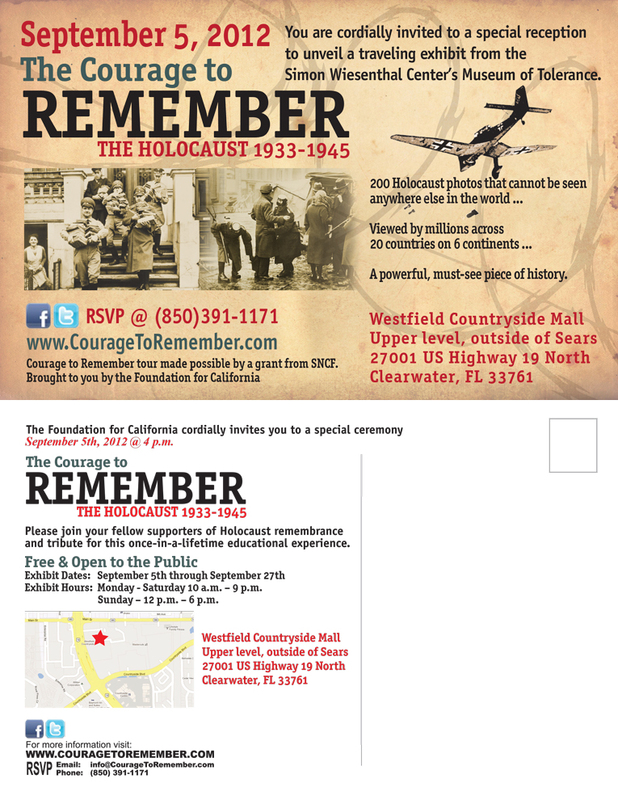 A special opening ceremony will be held on September 5 at 4 p.m. on the upper level of the Westfield Countryside Mall, outside of Sears (27001 U.S. Highway 19 North, 33761), featuring special guest speakers, Holocaust survivors, local officials, and representatives from the Simon Wiesenthal Center and Foundation for California. Following the opening ceremony, the exhibit will be on display through September 27, free and open to the public during regular mall hours. 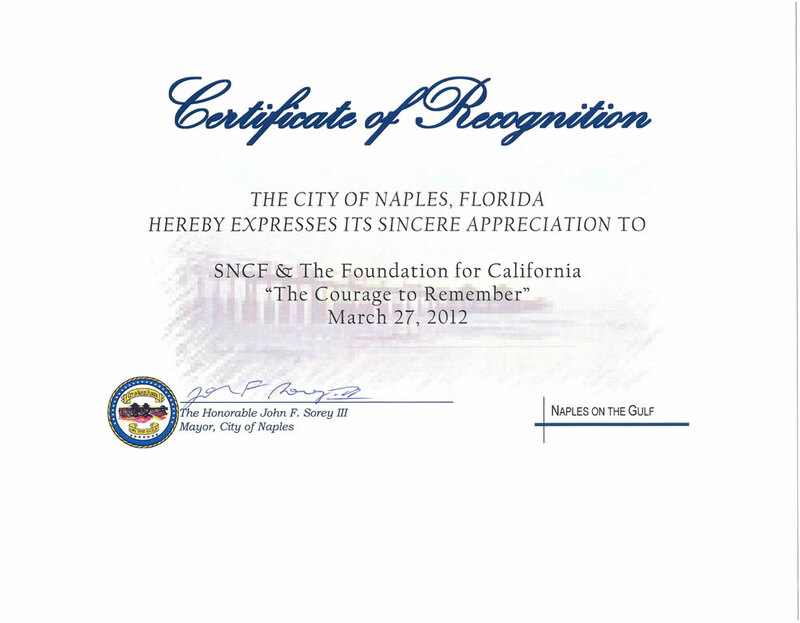 “The Courage to Remember” traveling exhibit, produced by the Simon Wiesenthal Center’s Museum of Tolerance, presented by the Foundation for California, and made possible by a grant from SNCF, has celebrated 20 years of international acclaim and a highly successful tour throughout California and Florida. More than 400,000 people have seen the exhibit in California alone. The exhibit, which is always free and open to the public, features more than 200 exclusive photographs that cannot be seen anywhere else in the world, offering amazing insight into the Holocaust through four distinct themes: Nazi Germany, 1933-1938; Moving Toward the “Final Solution,” 1939-1941; Annihilation in Nazi-occupied Europe, 1941-1945; and Liberation, Building New Lives. For more information on “The Courage to Remember,” its partners and schedule, and to see photos and videos from opening events, please visit www.couragetoremember.com, find the exhibit on Facebook, or follow twitter.com/courageremember. Incorporated in 1986, the Foundation For California, a non-profit 501(c)3 educational corporation, was established to perform educational programs on issues of importance to the public. Over the past 25 years, the Foundation has hosted conferences on public policy issues, sponsored educational lecture series and unveiled traveling exhibits, bringing the important issues of our society to the forefront of discussion on these important topics. May 16 at 5:30 p.m.
As the state of Florida continues to reel from the recent death of Trayvon Martin, as well as a reported increase in anti-Semitic vandalism, harassment and bullying in South Florida’s neighborhoods, schools and college campuses, and Jewish institutions, many are left wondering, how can we best combat the dangerous impact of discrimination and hatred? 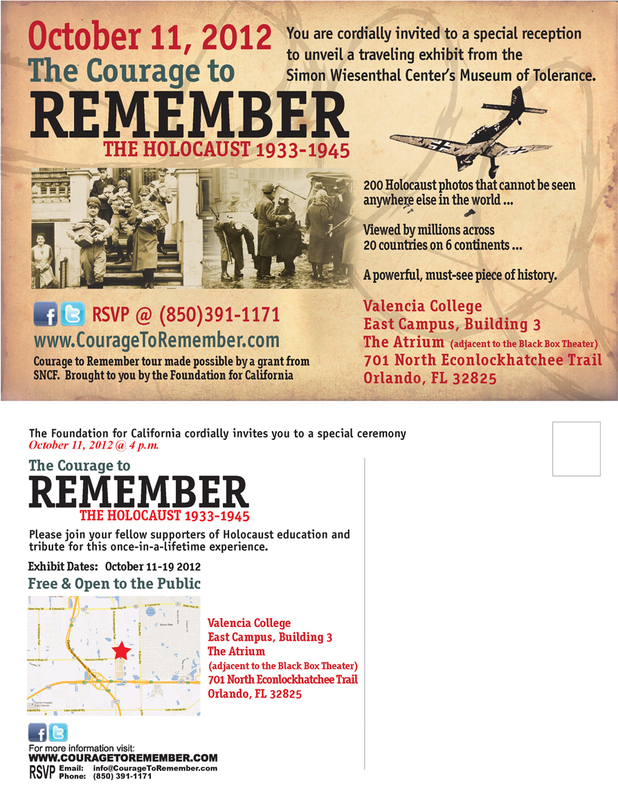 The Simon Wiesenthal Center’s “The Courage to Remember: the Holocaust 1933-1945” traveling exhibit strives for just that, empowering generations to resist ignorance and fight discrimination, as it comes to Broward County May 15 through May 31, with a special opening ceremony slated for May 16 at 5:30 p.m. at the David Posnack Jewish Community Center. “The Courage to Remember: the Holocaust 1933-1945” traveling exhibit, produced by the Simon Wiesenthal Center’s Museum of Tolerance, presented by the Foundation for California, and made possible by a grant from SNCF, has celebrated 20 years of international acclaim and a highly successful tour throughout California and the Southeast. More than 350,000 people have seen the exhibit in California alone. 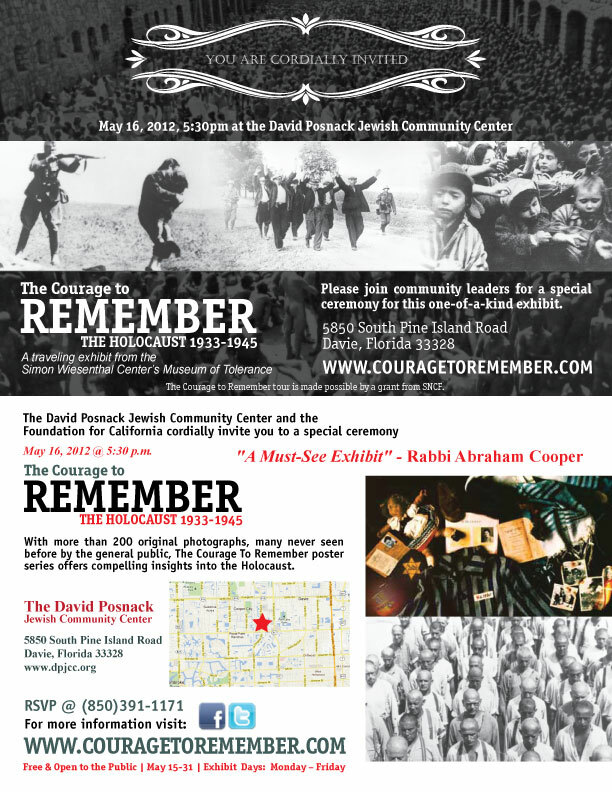 The opening ceremony event for “The Courage to Remember” in Broward County will be held on May 16, 2012 at 5:30 p.m. at the David Posnack Jewish Community Center in Davie (5850 S. Pine Island Road, 33328), featuring guest speakers, Holocaust survivors, elected officials, and representatives from the Simon Wiesenthal Center. “It may have been more than 75 years since the Holocaust, but violence motivated by race and ethnic background make up more than half of all hate crimes in Florida, and more than 65 percent of anti-religious hate crimes are against Jews, vastly more than any other religious group,” said Linda Medvin, Chair of the Florida Department of Education Commissioner's Task Force on Holocaust Education. “Holocaust education and tribute is critical in that it encourages new generations of forward-thinkers. 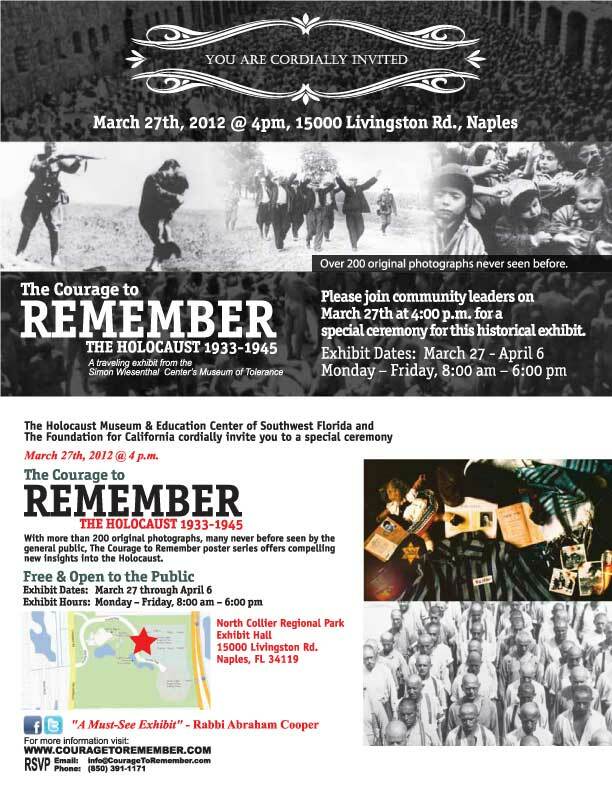 ‘The Courage to Remember’ exhibit teaches tolerance of diversity, respect, and responsibility, and we are proud to host it in Broward County and across South Florida,” Medvin added. For more information on “The Courage to Remember,” its partners and schedule, and to see photos and videos from opening events, please visit www.couragetoremember.com or follow twitter.com/courageremember. For more information about the David Posnack Jewish Community Center, please visit www.dpjcc.org or www.facebook.com/dpjcc. Incorporated in 1986, the Foundation For California, a non-profit 501(c)3 educational corporation, was established to perform educational programs on issues of importance to the State of California, its local communities and the people of California. Over the past 25 years, the Foundation has hosted conferences on public policy issues, sponsored educational lecture series and unveiled traveling exhibits, bringing the important issues of our society to the forefront of discussion throughout California. January 17-31 from 8:00am to 7:30pm, Monday through Friday. 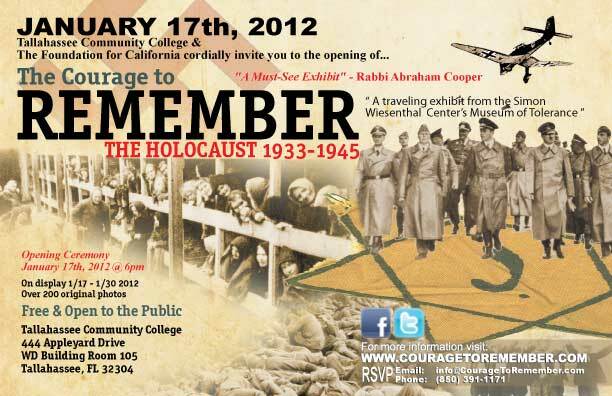 Tallahassee Community College and the Foundation for California cordially invite you to attend the exclusive opening of The Courage to Remember : The Holocaust 1933-1945, a traveling exhibit from the Simon Wiesenthal Center’s Museum of Tolerance on the evening of January 17, 2012. The Courage to Remember, which is free of charge and open to the public, has enjoyed international acclaim for more than 20 years, as well as a wonderfully successful tour throughout California. To date, more than 2 million visitors in 73 locations have viewed the exhibit, making it the most widely attended traveling exhibition on Holocaust education and remembrance. The Courage to Remember is a tribute to the millions of Jews and other individuals who suffered at the hands of the Nazis during the Holocaust, as well as an important lesson that strengthens future generations against all forms of discrimination, racism, anti-Semitism, and hatred of others. 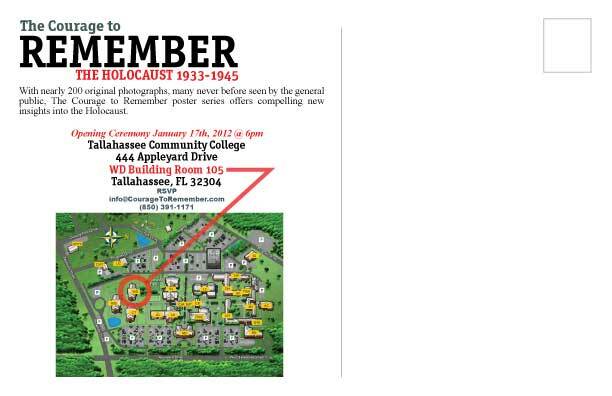 The Courage to Remember, hosted at Tallahassee Community College near the state capital, features 200 original photographs that are exclusive to the exhibit and offer unique insight into the Holocaust. Four fascinating themes include Nazi Germany, 1933-1938; Moving Toward the “Final Solution,” 1939-1941; Annihilation in Nazi-occupied Europe, 1941-1945; and Liberation, Building New Lives. “Never forget,” is a timeless and invaluable message. 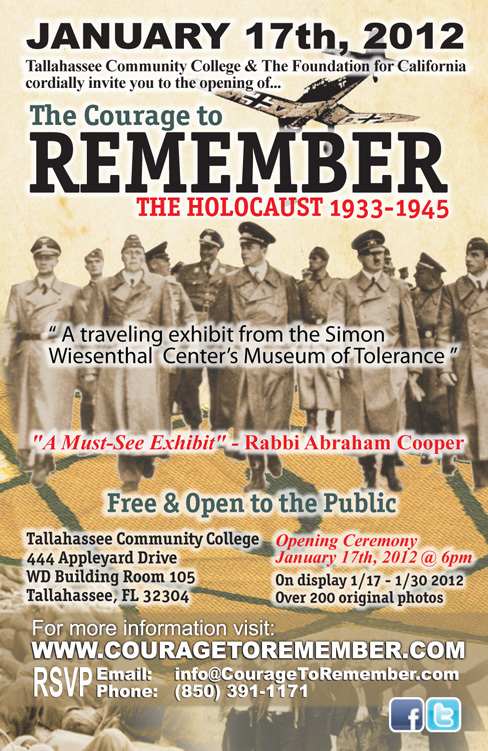 Please join Rabbi Abraham Cooper from the Simon Wiesenthal Center and Tallahassee’s local supporters and notables for this special ceremony to introduce the award-winning Courage to Remember exhibit to Florida for the first time! 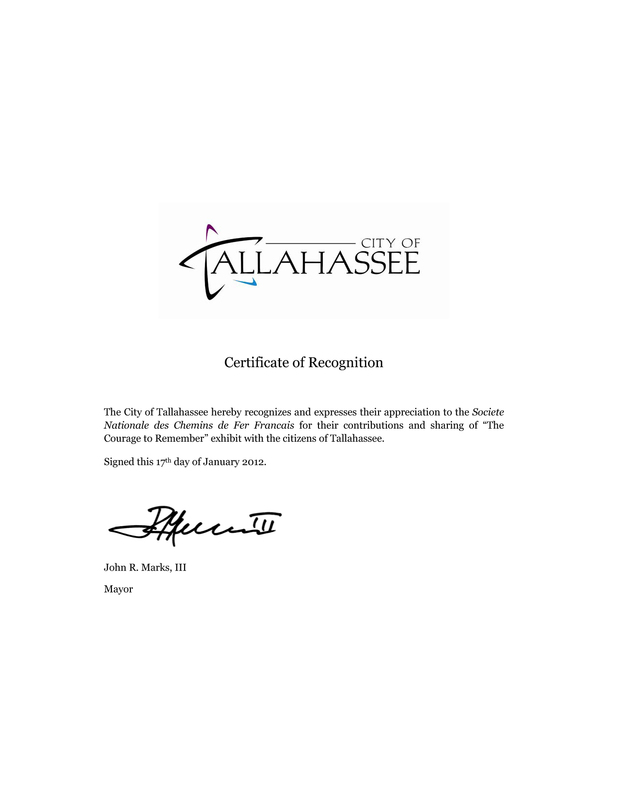 Presented by Tallahassee Community College and the Foundation for California. When: January 17, 2012 @ 6 p.m.